Hodge partners with CLARK to raise money for breast cancer awareness. To support Breast Cancer Awareness, Hodge in Peoria, Illinois is hosting a special fundraiser in the month of October. They’ve purchased a special pink ribbon forklift which will be available for rent all month long. Hodge will donate all rental income generated by this initiative to support Breast Cancer Awareness. Hodge purchased the pink ribbon lift truck as part of a larger campaign sponsored by forklift manufacturer, CLARK called “Raising Hope.” To raise awareness of the impact of breast cancer, CLARK invited dealers, like Hodge, to purchase their special edition pink forklift. With every purchase, CLARK matched a portion of the forklift cost and donated it to support Breast Cancer Awareness. Hodge has taken these efforts a step further by organizing their own forklift rental fundraiser. 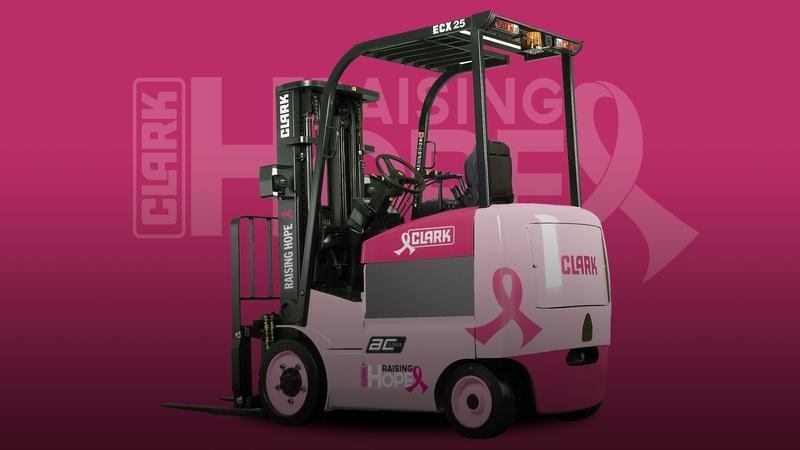 "When we found out about CLARK's efforts to support breast cancer awareness with the this special edition forklift, we were thrilled to participate," says, Todd Kintop, Hodge VP of Material Handling. "Breast cancer affects so many people and we wanted to do our part alongside CLARK to benefit this worthy cause." Fill out the form below to rent this forklift. A Hodge representative will be in touch to confirm the rental. Hodge is a growing, performance-driven material handling and logistics company providing a breadth of related products and services ranging from: warehousing & distribution design, development and execution, sales/service of material handling equipment & systems, and a variety of engineered supply chain management and value-added services. The company employs nearly 800 employees across 24 locations and 5 states. For more information please visit hodgecompany.com or contact Michael Fullan, Hodge Marketing Manager at mfullan@hodgecompany.com.